On many occasions I discuss the great progress we have made in weather forecasting, including winter storms, in recent years. However, that progress is primarily in the 48-hour and less time period. We still have little ability to consistently forecast winter storms five days out or more. Here is a good example. Using a 10:1 snow to water ratio, Washington, D.C. would have 14"; Richmond, 15"; Philadelphia, 22"; NYC, 21"; Boston 17". This would be a crippling storm as the models indicate it would be accompanied by high winds. With the exception of Providence and Boston, the path of the storm is too far into the Atlantic for heavy snow to fall in the Northeast. 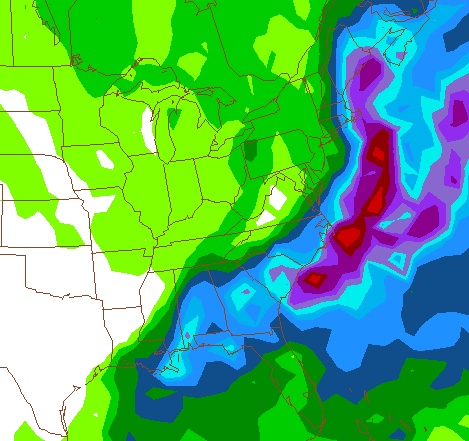 For example, this model is only predicting about 2" for NYC. At this point, I don't know whether either of these is correct or whether the storm will evolve according to some third scenario. It is often tempting to try to stretch the science beyond what it can reasonably do. I'm happy if I get an accurate forecast of snow amounts a full 24 hours in advance. That gives adequate time to prepare and minimizes unnecessary preparations due to false alarms. ADDITION: Well over 250 people have viewed this posting in the first half hour it has been up. Kim and I invite you to explore the blog while you are here. Comments are always welcome as are new blog followers. Topics of recent posts are at right. Thanks for visiting!! Shifts in model runs like this are expected. Especially with 06Z and 18Z runs because there is no radiosonde data. Also, remember what the trend has been this winter so far, with storms trending northwest as the event nears. We'll see what happens and this storm is certainly not off the books just yet. Brent, point well taken. The post is referring to the 00Z European and GFS. I was not using the 06Z run. 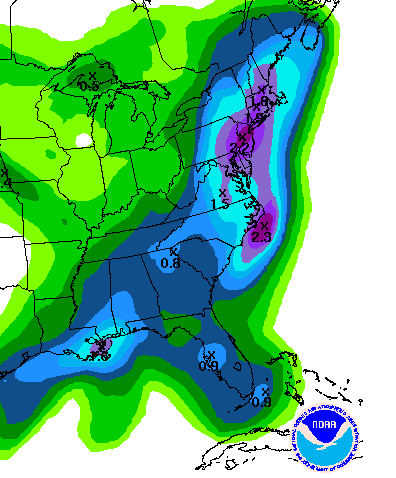 The two graphics above are the final NWS 5-day QPF and the 12Z GFS. A good read....on the model consensus, I still think we'd be better off investing in more upper air data ingestion points than always just pouring all of the funds into bettering model biases with the hardware and software itself. With that being said, I think the ECMWF has done a pretty good job this winter, even 48-96 hours out. I'm anxious to see what this morning's 12z runs show for this system, but I noticed the NAO index looks to be negative again through the end of JAN. Yes, either spend more money for full time upper air stations or run the NOAA jet with dropsondes in these situations starting when we are 72 hours or less until the storm's development (I'm trying to balance cost here, running the jet is very expensive). Well put. Not to get on MY horse but how can "Climate Models" predict? I believe you're making a valid point with the models. They should be used what for they are routinely referred to as "guidance". Meteorology is an ART and a science. Yes, meteorology is an art and a science. I make that point in my book advertised on the blog at upper right. You are absolutely correct about the climate models. They have no proven skill and have consistently been too warm the last 20 years. If you would like to read more about my thoughts on global warming, just Google: meteorological musings global warming .